﻿ Book Hotel Mocking Bird Hill (Port Antonio) - 2019 PRICES FROM $262! 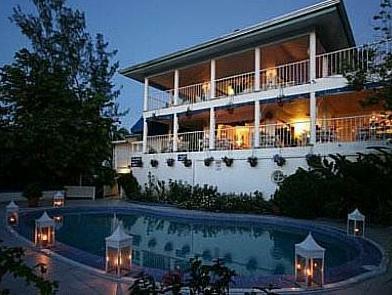 This environmentally friendly hotel is located in Port Antonio, 5 minutes’ drive from the beach. It offers an outdoor pool, an on-site restaurant and rooms with views of the Caribbean Sea. The bright guest rooms at Hotel Mocking Bird Hill have European-style bathrooms, coffee-making facilities and free Wi-Fi. Each includes a balcony with views of the sea or the surrounding gardens. Creative Caribbean cuisine is served at Mille Fleurs Restaurant. Guests can dine on the terrace and enjoy drinks in the evening on the upper-level Perch. The Mocking Bird Hill Hotel features a massage gazebo and a Garden of Wellness with a variety of treatments available.Entrance complementary to French man Cove Beach, is 5 minutes away from the property. The property is 15 minutes away from Blue Lagoon and amazing views of the Caribbean Sea can be appreciated from the entire property. Portland Parish Church and Fort George are 2.5 miles from Mocking Bird Hill. Please note there is a complimentary shuttle to the beach.